Poultry - Enlightened Solutions Ltd. - Paleo Nutrition - Designed By Nature. This is "good enough for company", and suits a primal or low carb diet perfectly. Preheat oven to 375d. Line a baking sheet with foil and place a baking rack on it. Cut chicken breasts in half lengthwise. Pound each half so it is about 1/4" thick. If they are too thick, they won't roll up as nice. Mix together softened cream cheese, chopped green onions, dill and shredded cheese. With a butter knife, spread about 1 - 3 TBSP of this mixture into the middle of each piece of chicken, staying away from the very edges, and roll the chicken breasts up. Wrap 1 to 2 slices of bacon around the chicken breast, securing with a toothpick, if needed. (I don't do this). One piece of bacon wrapped around each will do, but 2 will fully wrap the chicken and tastes better. Place on the rack on a foil lined baking sheet and back for 40-45 minutes. Broil the tops ay 500d for about 5 minutes to fully brown and crisp bacon. Turn each breast over and broil for another 3 minutes or so to crisp up the bottom side. Watch them closely inder the broiler… they will go from perfect to charcoal very quickly! Did the cheese melt and and come out of the chicken? We call that “cheese sauce”! Spoon it over the chicken and serve with a green salad. Delicious doesn't even begin to describe!! Cook bacon and save the fat. When cooled, put bacon into a food processor and blend until you reach a grainy consistency. Pour ground bacon into a separate bowl and add in almond flour, cheese and spices. Cover chicken breast in plastic wrap or waxed paper and flatten using a meat mallet. Cut into 2 inch strips. Whisk eggs in a small bowl. In a large skillet, add bacon fat or coconut oil and heat on medium to high. Take each chicken strip and dip in egg, then roll in the bacon mixture to coat evenly; pressing it in. Arrange strips in the frying pan and cook for about 3 minutes or so on each side. Using tongs, flip when side looks crispy and repeat on other side. Do not overcook. When finished, allow them to cool and crisp up on a wire rack. These are SO delicious... no dip is needed. Serve with raw veggies (OK... you can dip those) or a side salad. Who says low carb fare is boring?? Preheat oven to 425F. 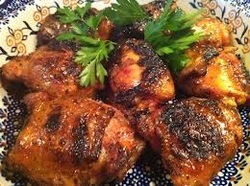 Pat the chicken thighs dry and leave them to rest for a few minutes while you make your sauce. In a small bowl, mix together the olive oil, ketchup, rice wine vinegar, hot sauce, minced garlic, and minced ginger. Add thickener of choice and mix well. Season the chicken generously on the skin side only, with salt and pepper. Use your hands to rub the sauce all over the chicken thighs. Get into all the crevices! When each piece of covered, place on a baking rack that has been sprayed with non stick spray. Place the baking rack on a foiled covered cookie sheet and bake for 50 minutes. Remove chicken from the oven when it is crisp and slightly blackened, as if it was grilled. Mix spinach or steamed vegetable, crushed chilis, and the leftover chicken fat (schmaltz) from the pan together. Add salt and pepper if desired. This recipe comes from one of my oldest and dearest friends, Heather Stevenson. This has always been Heather's "go to meal" when she wanted to have something a little special. I have adapted her original recipe ONLY enough to make it friendly for ancestral diets. Enjoy. -6 pieces of chicken. You can use thighs and drums, but chicken breast sliced into strips or cubes works well too. (I bet this recipe would also be fabulous with pork as well). ** Make it nightshade-free by subbing bean sprouts for the bell pepper. bell pepper and mushrooms. Cook until onions are transparent. Add chicken back to the onion mixture. Blend peach syrup and rice flour , soy sauce, and vinegar in a small bowl and add to the mixture. Make sure that you blend these ingredients separately... do not try to add them individually to the recipe. Cook till thickened. Add peaches and tomatoes. Heat through, but don't over heat. You want the peaches and tomatoes to be hot but firm... not cooked apart. Mix mustard and melted butter. Dip chicken to coat. In a shallow bowl, combine the parmesan and almond meal/coconut blend with the dry spices. Dredge the chicken pieces in the mixture, coating heavily and pressing the coating into the meat. Put the chicken on a rack set over a baking sheet, spray with a quick burst of cooking spray and put the sheet in the middle of the oven. Alternately, you can use parchment paper and no rack. Bake until the chicken is golden and cooked through, about 30 to 45 minutes - depending on the size of the chicken breasts. This recipe is not only Paleo, gluten free and Perfect Health Diet friendly... but is stupid good. This is a variation on a recipe that I found on http://www.skinnytaste.com. So good and so easy! 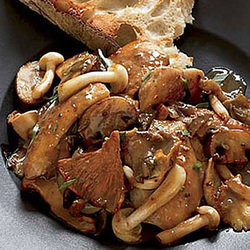 Don't be afraid to try different types of mushrooms. Oyster mushrooms are great! Season chicken with salt and pepper. Lightly dredge in coconut flour. Heat a large skillet on medium heat; when hot add 1 tsp butter and 1 tsp olive oil. Add chicken to the skillet and cook on medium heat for about 5 minutes on each side, or until chicken is no longer pink. Set aside in a warming tray. Add wine, chicken broth, parsley; stir with a wooden spoon breaking up any brown bits from the bottom of the pan. Cook a few more minutes or until the liquid reduces by half. Top the chicken with the mushroom sauce and serve. You can use your outdoor BBQ grill, or use your contact grill (George Foreman). 4 pounds chicken parts, on the bone or boneless. You can even use a whole flattened chicken. You may use skinless chicken, but remember that skinless breast will dry out easier. To combat this, leave the skin on the chicken breasts for cooking and remove prior to serving. In a medium sized bowl, combine first 10 ingredients. Place chicken into a marinating container, or you can use a zipper seal bag. Do not pierce the chicken pieces! Doing so will allow all of the moisture to drain from the chicken and cause flare ups on the BBQ. Remove chicken from fridge about 30 minutes prior to grilling and pre-heat BBQ or grill. Cook over medium heat for about 30 to 35 for BBQ (about 10 - 12 minutes for contact grill). Turn at least once if BBQ'ing. Chicken is done when internal temperature reaches 165d F (74d C). Wash and pat dry the breasts dry with paper towels. Pound them to flatten, using a rolling pin or the flat side of a meat mallet. This is messy, so place the breasts in an unclosed baggie or 'sandwich' them between wax paper. Use bowls large enough to hold the chicken pieces. Have the beaten eggs ready in one bowl and the Parmesan cheese in another. Dip each chicken breast in egg, then roll in the cheese. Preheat a large, heavy skillet. Add the oil and heat. Saute the chicken slowly, turning to brown and cook evenly on both sides. Keep your temperature to the lower side as the cheese will burn fairly easily. You should have a crispy coating when you are done. I add other seasonings to the cheese, but this is the basic recipe. Experiment away!! Serve as an appetizer, or pair with your favourite green salad for a great healthy meal, free of grain, soy and dairy. Using a meat mallet or something heavy such as a rolling pin, place the chicken breasts between layers of waxed paper and pound them to an even thickness. Cut the chicken into long strips that are about 3/4″ to 1″ in width. You will need three bowls; one for the coconut flour, one for the coconut milk/egg mixture and one for the coconut/seasoning mixture. Coat each chicken strip in the coconut flour, then dip in the egg and coconut milk mixture and finally coat in the shredded coconut and seasoning mixture. When finished, place the chicken strips on parchment paper on a large baking sheet, leaving a bit of space between each strip for even cooking. Bake for 10 minutes, turn and bake 10 minutes more to add crispness. Make sure that chicken has turned completely white inside. Serve with Barb’s Coconut Dipping Sauce (it's on our Condiments, Marinades and Sauces page).